Over a number of years living, studying and traveling in the Mediterranean and Islamic worlds, often visiting classical sites and museums by day and rug shops at night, I have at times been struck by a resemblance between Roman mosaics and oriental carpets. At first, this seems surprising as the former are composed of hard immovable stone and the latter of flexible, portable fabric. Furthermore, the two are apparently separated in time by one or two thousand years, and belong to two distinctly different cultural traditions . Do their similarities arise then simply from the functional coincidence that they both serve as decorative floor coverings, or is there some direct connection? Carved threshold slabs in Assyrian palaces appear to be stone reproductions of textiles or carpets of which the oldest complete pile carpet, the Pasaryk rug, would seem to derive . Were classical mosaics likewise modeled on contemporary weavings of the time whose legacy could have been carried on in later kilim tapestries and pile carpets? Or could these later weavings have been influenced, even if indirectly, by the patterns in the mosaics? Many scholars have noted similarities between rugs and mosaics , while a contrary view warns that apparent resemblances are just as likely to be independent developments of motifs . In order to determine the extent of the similarities and if they are "genetic" and have a direct relationship and/or a common source, I have made a preliminary survey comparing and contrasting Greco-Roman and Byzantine mosaics with traditional kilim and carpet designs. I restricted myself primarily to Turkey and began by focusing on border patterns, a conservative decorative device shared by all three . From this study have come some surprising findings that lead in some unexpected directions. The analysis and conclusions are based on a number of principles that I believe are critical for understanding the transfer and development of decorative patterns. Classic mosaic borders imitated numerous woven or decorative textile designs, some of which are also found in kilims and carpets. Many mosaics, however, also copied or imitated the geometric patterns of the more valuable and prestigious opus sectile marble marquetry pavements that saw a renaissance under the Byzantines, and many of these same patterns also appear in carpets. Textiles of the Byzantine era also incorporated these opus sectile patterns and their influence, in combination with a variety of textile motifs, can be seen not only in weavings of the Mediterranean Islamic world, but also in Central Asia. M. Eilands JR. & III describe it as "something on the order of a portable mosaic." Oriental Carpets; a complete guide (Boston, 1998) p. 14. 2. David Stronach, "Patterns of Prestige in the Pazyryk Carpet: Notes on the Representational Role of Textiles in the First Millennium BC," in Oriental Carpet and Textile Studies (OCTS) if,ed. M.L. Eiland, Jr. (Berkeley, 1993), pp. 19-34. 3. R. Pinner and M. Franses note similarity between Roman and later Egyptian fountains and 'Mamluk' carpets ("An East Mediterranean Carpet in the V&A," Hali, vol. 4 no. 1 , p. 37; Dr. H. Bartels points out likenesses in "On the Origins of Anatolian Kilim Designs," OCTSI, 1985, p. 206. 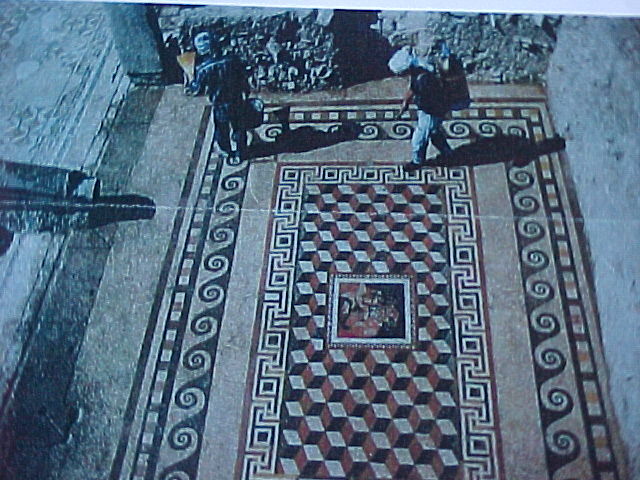 V. Gantzhorn illustrates Roman and "post-Roman" mosaics in Cilicia and the Levant for early carpet designs (Les Tapis d'Orient, 1998, pp. 58-65). Dr. Enderlein sees the resemblance between the border of a mosaic in Berlin, originally from Pergamon, and a kilim (cf. "Fragments," Hali, 68, April/May, 1993, p. 93. Robert Pinner finds "Crivelli" rug medallion prototypes in a Sogdian textile from the Caucasus and Roman mosaics in Sicily and England ("The Crivelli Rug Medallion and the Turkmen Connection," OCTS IV, p. 245). Carol Bier alludes to Roman mosaics in her discussion of fractal geometric patterns in rugs ("Elements of Plane Symmetry in Oriental Carpets," The Textile Museum Journal, 31, 1992, p. 54 & 60). Tom Murray remarks on the resemblance between a second century AD Roman mosaic in a gallery in New York and the elusive geometric field patterns of many oriental carpets (Hali, 73, Feb./Mar. 1994, p. 71). 4. L. E. Folgelberg, "Universality and Interrelationships of Certain Design Elements," OCTS VI pt. 1 (Danville, 1999). 5. Sheila Campbell's Corpus of Mosaic Pavements in Turkey: The Mosaics of Antioch (Toronto, 1988), The Mosaics of Aphrodisias in Caria (Toronto, 1991), The Mosaics of Anemurium (Toronto, 1998) have been a major resource for mosaics. the Turkish Ministry of Culture and Tourism's series Turkish Handwoven carpets; catalog No. 1-5 (Ankara, 1987, 1988, 1990, 1990, 1995) and The Ministry of Culture's Anatolian Kilims, 1-2 (Ankara, 1995) published in memory of Guran Erbek are the primary source for traditional weavings. It was he who first introduced me to kilims in Turkey and who was instrumental in this project to make available photographs of pieces from Vakiflar storage, museums, and private collections in order to provide patterns from the past for modern weavers and scholars. I am also deeply indebted to Susan York, an artist whose experience with weaving and mosaics has also led her to wonder about a connection between them. Her extensive library, slide collection and photographic assistance, plus many insights and guidance have been invaluable.